Buy Now A coupon is available! Click to see the coupon code. This is a BUY 1, GET 2 FREE offer! Go to Store A coupon is available! Click to see the coupon code. This is a BUY 1, GET 2 FREE offer! 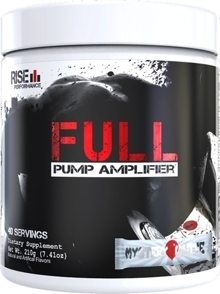 FULL is a Non-Stimulant based Pre-Workout designed to gorge your muscles with the nutrients it craves throughout your most intense workouts. Betaine Anhydrous: Betaine or trimethylglycine (TMG) has been shown in research to increase nitric oxide and helps regulate cellular fluid volume. This further promotes overall muscle fullness and size as well as aid in nutrient delivery to the muscle tissue. Taurine: Taurine helps with blood flow and increases cardiovascular capacity. It will additionally fend off cramping during your most intense sessions. During early testing of FULL, we found that the pump could often be so strong that back pumps became an issue so instead of tone it down, we added in this ingredient to keep it just as strong. Potassium Nitrate: Potassium Nitrate (KNO3) is a secret weapon in FULL. Many products feature this ingredient as a standalone pump product. Not here. KNO3 greatly increases vascularity and vasodilation allowing more blood to flow to muscles which consequently increases oxygen delivery to the tissue and overall endurance. L-Norvaline: While the other ingredients deal with increasing nitric oxide production, Norvaline works in a different way. When nitric oxide is produced, it also creates an enzyme called Arginase which tries to limit the amount of NO your body can produce. In effect Arginase creates a ‘ceiling’ on how much of a pump you can obtain.. Here at Rise Performance, we don’t believe in ceilings. Norvaline inhibits arginase production and allows you to continue to produce nitric oxide for the strongest and fullest pumps possible for as long as possible. Country Style Lemonade This is a BUY 1, GET 2 FREE offer! Mystery White This is a BUY 1, GET 2 FREE offer!